When the topic of spring produce comes up, my mind immediately goes to sweet peas and crisp radishes. Even asparagus is a second thought in comparison to those two. There’s just something about peas and radishes—especially together—that screams freshness to me. Add some lemony anchovy butter and fresh dill to the equation, and you’ve got the perfect blend of complements for those tender omega-3 rich sardines. In my time partnering with King Oscar, I’ve been challenged to think outside the box when it comes to working with sardines. I’ve incorporated them into Greek-inspired pitas and I’ve stuffed them into a melty, messy grilled cheese sandwiches. One thing that the folks at King Oscar and I have noticed, however, is that many sardine lovers are purists; they don’t feel the need to get fancy with their favorite little fish. And every once in a while, we like to recognize that with a recipe that’s on the simpler side. King Oscar sardines don’t need fancying. There’s a reason why these wild-caught brisling sardines in extra virgin olive oil are the brand’s most sought-after flavor. Even with mouthwatering variations like Mediterranean and Hot Jalapeño, the clean slate that is the brisling sardine in extra virgin olive oil wins. And that’s because quality food needs very little help. Like a good steak needs nothing more than a solid seasoning of salt and pepper, a good pack of sardines needs nothing more than some quality olive oil. (But trust me, the other flavors are totally worth digging into.) If you can’t find King Oscar’s sardines at your local supermarket, Amazon’s got your back. The refreshing flavors in this recipe let the sardine shine. I also decided to use King Oscar’s perfectly salty anchovies in my lemony anchovy butter. They are, hands down, the best tinned anchovies you’ll find at the supermarket. I hope the rest of your week goes quickly, and I hope you have a wonderful weekend filled with delicious food! I’ll be back next week with an incredible pizza recipe. You won’t want to miss it. 2-4 red radishes, thinly sliced (preferably with a mandolin on the thinnest setting) Amount of radishes depends on their size and how thinly you can slice them, so eyeball it. 1/4 cup peas Fresh peas are preferred. Sugar snap peas work wonderfully. If you can't get your hands on fresh, get frozen and thaw them prior to preparing your canapés. 1 can of King Oscar brisling sardines in Extra Virgin Olive Oil; two layer or cross-pack. *See notes. In a small bowl, thoroughly mix the butter, minced anchovy fillets, and lemon zest. Set aside. 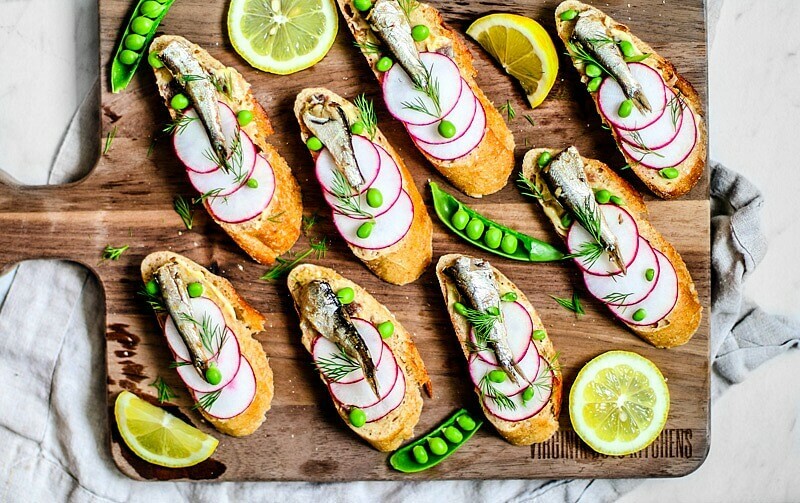 Top each baguette slice with a few radish slices, peas, and a sardine fillet. Top with freshly chopped dill and drizzle with freshly squeezed lemon juice. King Oscar's Brisling Sardines in Extra Virgin Olive Oil are available in a two layer pack with 12-22 fish and a cross-pack with 24-38 fish. Distribute the sardines over the crostini as you see fit depending on which tin you purchase. Want to kick things up? King Oscar's Cracked Black Pepper brisling sardines would be a great substitute in this recipe. Oh my gosh - I LOVE Sardines! People think I'm crazy but this recipe shows I'm not - I want to dig right in, yum! The lemon anchovy butter was magical too! Love sugar snap peas. I have them in the fridge all the time. Such a great healthy snack. Pairing them with sardines is a great idea. The sweet peas and salty fish would make an interesting and tasty appetizer. These look party perfect. oh my gosh!! Dana these look amazing! I love the spring flavors here with the radishes and peas, and omg anchovy butter?! I (of course) have tons of sardines at home, and they need to land on these canapes!